Don’t you love that tagline? It really makes you think ‘Oh good, I like my wasabi hot’ OR ‘Oh good, I like my wasabi mild’. After all, the customer is always right! Right? A little while ago I posted about my supply of fresh wasabi from Tasmania and some of you complained that you couldn’t access it. I’ve fixed that problem. Enter Pure Wasabi (stage right). Pure Wasabi is a commercially available product made of, well, pure wasabi. It’s grown in Coppersfolly in New Zealand, then freshly bottled and made available to you via that magical vessel – the internet. And guess what Sydneysiders? I spotted it in Harris Farm at Broadway last week in the fridge at the back. So you’ve got no excuse not to try this recipe. As I’ve mentioned before there really is no comparison between fresh wasabi and the bright green stuff you get in a tube at the supermarket. It’s a pungent and delicious taste sensation that can be used for so much more than sushi. If you don’t believe me, check out my posts for wasabi salad dressing and wasabi salmon canapes as well. 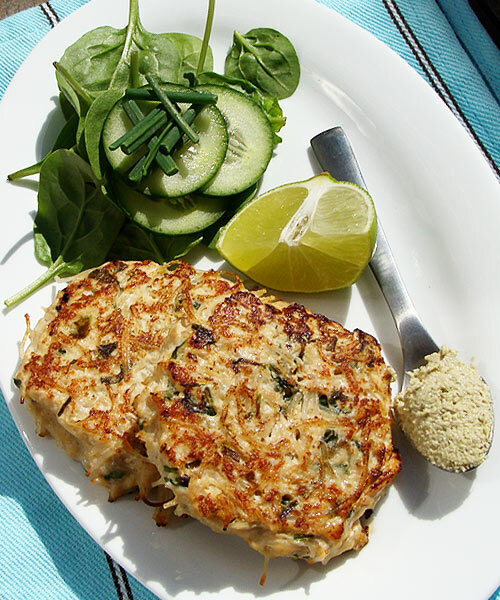 For now though, grab yourself some chicken mince, and make these scrumptious patties. Serve them with salad, steamed veggies or simply squashed between a soft roll and splashed with sweet chilli sauce. Yum! Don’t be alarmed by the long list of ingredients. Once you’ve got them all prepared, the rest of the cooking process is super easy. 1. Soak the rice noodles in warm water until softened (about 15 minutes). Drain and roughly chop into shorter lengths. 2. Add the rice noodles and all the remaining ingredients except the peanut oil to a large bowl and mix thoroughly. It’s best to use your hands for this. 3. With wet hands shape the mixture into 8 even patties and chill, covered, for 30 minutes to firm them up. Pre-heat the oven to 180C/350F. 4. Heat a large frying pan and add half the peanut oil. Fry 4 of the patties for 2-3 minutes each side and transfer to a baking dish. Repeat with the remaining oil and patties. 5. Place in the oven to finish cooking (about 15-20 minutes). Serve with salad or steamed vegetables and extra wasabi on the side. I just made a mess in my rompers reading this. Most definitely bookmarking it. Dear God, I can’t stop drooling. Any ideas on fresh wasabi here in Melbourne, anyone? Never make a patty with wasabi, chicken and noodle sounds very tasty a mouthwatering recipe Christie. Hungry again… straight to lunch! LOL at pg’s comment! Sounds interesting, hubby would love this! These look absolutely divine Christie! I love the Asian inspired flavours and that wasabi too! A list of stockists within Australia are on their website for anyone who might find the Broadway store too much of a trek http://tinyurl.com/r7jnqq. Woohoo, go the product of New Zealand! I’ve never had rice noodles this way. Looks really good! These look so delicious! I wish I had them around right now, the perfect hangover cure! Had no idea real wasabi is available in a jar. The fresh stuff is so rare and expensive here. Interesting idea! What made you think you wanted patties instead of just making noodles? @pg – Oh my goodness, you’re so funny! @Steph – Yes, the chicken mince makes them much lighter and healthier. @Gera – I think they post the jars anywhere in the world, so you should be able to get some! @Lorraine – I hope you make them for Mr NQN! @Sneh – I love wasabi peas! Yummy. @Peter G – Thanks Peter! I can’t live without Asian flavours, especially kaffir limes leaves. @Simon – True that real fresh wasabi is the best thing. But Pure Wasabi is definitely better than those yuckky green tubes! @Pigpig – I’m always trying new things! @Rebekka – I hope you’ve ordered it now. @Megan – They’d be great for a hangover in a roll with sauce! Wow! in a jar! That flavor & the entire thing looks sounds unique & divine. This sounds so interesting. I’d love to try it! Now these patties are so creative! Yum! Yum! I want one of these for breakfast. I know, I’m crazy! Made these last night and am eating the left-overs for lunch right now. Amazing! Thanks for the great combo. Those look amazing– I am soo trying that. Still thinking about these. Do you think they would work with salmon instead of chicken? Hey Rebecca – I don’t see why not! I’d suggest poaching the salmon and then flaking it with a fork to get the right texture. Or use canned salmon. i have saved that great recipe to try later..
Nice blog that you have and I find your recipes very fresh ! Funny with that one because I have posted today scones with wasabi which is not common in France ! I have created my food blog and if you like french creative food come and have a visit you are vary welcome !